Have you ever driven to the airport, caught your flight, returned from your holiday, and realised you have no idea where you parked your car? According to Dublin Airport, 4,000 people had the same experience in the past year - with the problem most often affecting those parked in the long-term facilities. About one in every 170 customers had "recall issues" and contacted a member of staff to help them scour through all 18,600 spaces. To tackle the issue, Dublin Airport have introduced luggage tags at bus stops in all three of its long-term car parks, which drivers can use to write the zone and row number of their parking space. The only requirement is that each user holds on to their colour-coded reminder for the duration of their journey. 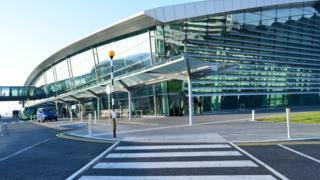 The airport's chief communication officer Paul O'Kane told BBC's Radio Ulster's Good Morning Ulster that the scheme was proving to be a great success. "It's understandable that people forget where they've parked, especially when they've been completely focused on going on holiday," he said. "Sometimes a person tries to find it themselves as they're too embarrassed to contact us, but after 30 minutes or so they give up and contact us for help. "Once we know when they came into the car park we can help them find the car easily enough. "However, in the last few days we've introduced the old-fashioned luggage tag system, and there has been a huge response from people who have used it." On social media many welcomed the new initiative, while others offered more modern-day solutions including taking a picture of the vehicle on a phone, or using a geo-tagging app to record its location. Whether you prefer the old-school or more modern methods, hopefully "losing" your car at the airport could soon become a thing of the past.